My change for today - no camera. As I get older, I get more easily distracted and forgetful when stressed. Yesterday, as I was preparing to run off to the airport, my staff besieged me with problems and questions. As I sat down in the plane, I suddenly realized I had no camera case. With the engines starting to rev up, there was no way I could run off the plane to look for it. When I got on the ground, I called them. The camera is not in the office and they looked around the airport too. There are worse things to happen - but I find myself seeing an image I want to capture and reaching for my camera. I finally borrowed our project camera from one of the staff. It will do for now! We accompanied a TV crew making a documentary on UXO survivors, to the house of one of the people we've helped. 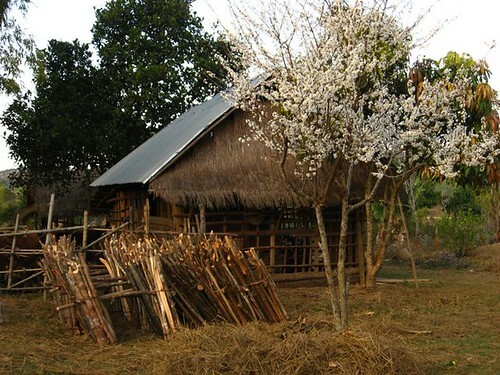 This is the cow pen, with a beautifully blooming plum tree in front of it.